Special 2-3 is the third level of Special 2 in Super Mario 3D Land. It is based off World 1-4, but the water has been replaced with lava. The player starts out on a small platform before moving onto a Switchboard that will lead them past a Rolling Spike a Coin Block and several Fuzzies. The second batch of Fuzzies have a Statue Leaf with them. Shortly after the Fuzzies the rails stop and across a platform is another Switchboard, which will leads past two Blokkabloks and a Rolling Spike before leading to a platform that contains the Checkpoint Flag. The player will then jump onto another Switchboard, but will have to jump down almost immediately onto another Switchboard, if the Switchboard is moved backwards it will reach a ? Block which contains a Poison Mushroom. If the Switchboard is moved to the right it will lead to a Red Ring which will spawn five Red Coins, if the player collects them all in time they will receive either a Statue Leaf, or a 1-Up Mushroom. On the next Switchboard a water geyser needs to be used to reach a higher rail, this will then have to be repeated to get onto the final Switchboard which goes them past more Fuzzies before the rail ends. The player then needs to jump off the Switchboard and onto a platform with a Warp Pipe which leads to the final area which contains several more Switchboards that must be used to get to the top of the Goal Pole. Star Medal 1: Floating above a Rolling Spike just before the Checkpoint Flag. Star Medal 2: By using the first water geyser the player can access the Star Medal, located to the left of the geyser. 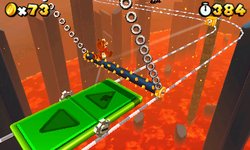 Star Medal 3: On the final rail the player must make the Switchboard go backwards near the edge of the rails to get it.